It's time to get back to dessert! Valentine's Day is a few days away and we should have more chocolate for the occasion. You can't go wrong with a classic so let's have chocolate cake! I put my mini bundt cake pan to use and made a couple of mini chocolate bundt cakes to share with my Valentines (that would be my husband and our rapidly-growing 9 year old). We love simple, straight-up chocolate cake - it never gets old, it just has to be good. These cakes themselves don't just look chocolaty, they also taste that way. Because of that, you don't necessarily need a glaze (a pretty dusting of confectioners' sugar would do) but since it's for Valentine's Day after all, I topped the cakes with chocolate ganache. Some of that ganache pooled into the hollow of the cakes and I told my son that was the "tunnel of love". I know...I'm so corny! This small-batch recipe from America's Test Kitchen makes two mini bundts so it's perfect for date night or an occasion like Valentine's Day. Like many of you, we prefer to stay in for Valentine's Day. More often than not, my husband and I celebrate early (on the closest Friday or Saturday night), with a relaxing dinner in the comfort of our own home. Dessert is naturally required and a chocolate cake like this would be more than welcomed. Because of the small scale and since I don't have a hand-held mixer, I made this recipe the old-fashioned way with my trusty wooden spoon and spatula. I enjoy being able to do that once in a while. 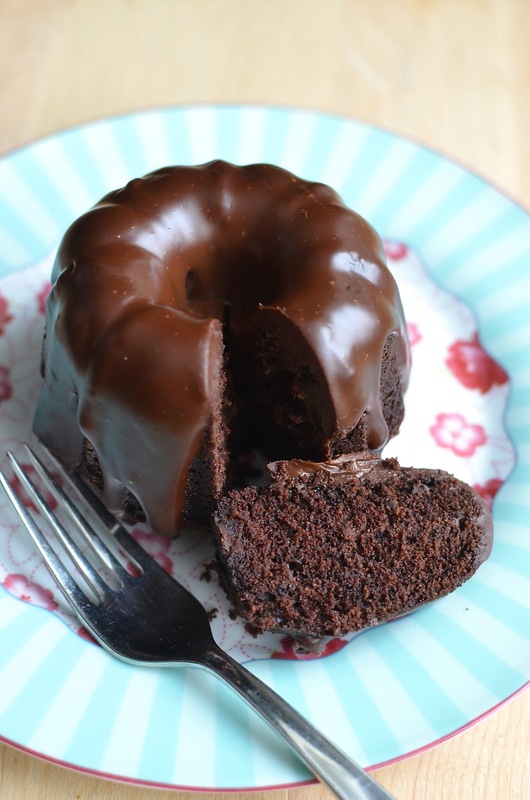 The effort it takes to make this recipe - from blooming the chocolate in a bit of boiling water to carefully transferring the batter into your two mini bundt molds - are well worth it since you end up with two adorable little chocolate cakes that are just how they should be - chocolaty. It has the kind of tight, dense crumb I expect when I think bundt cakes; it's moist and the icing on top is just that. I hope you have a very sweet Valentine's Day! I hope it's cozy and involves plenty of chocolate. I'm glad I took the plunge recently and bought a mini bundt cake tin because bundt cakes are just so pretty. It's almost a shame to cover the lovely groves with icing. 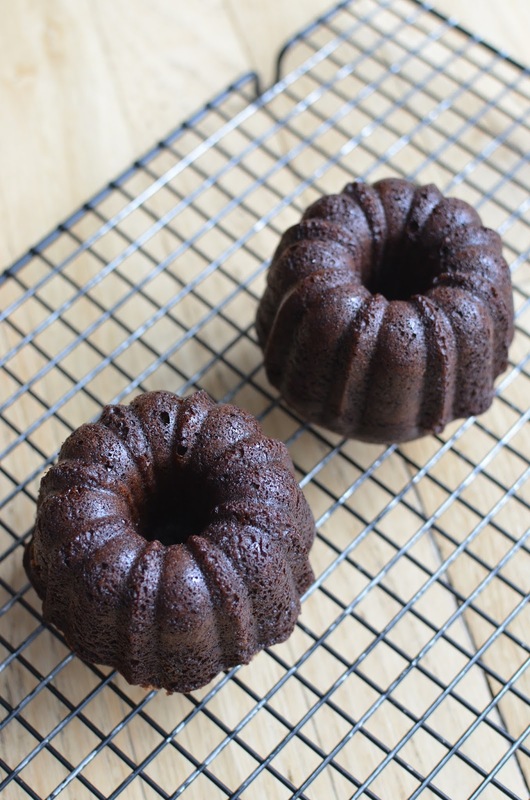 I baked these 2 bundt cakes in my mini bundt cake tin that has 6 individual cavities and a total capacity of 5 cups. Ideally, two individual 1-cup bundt pans should be used for this recipe. Oddly, I don't remember ever seeing mini stand-alone bundt cake pans like that. If you're using a tin like I did, you could easily double this recipe and divide the batter nicely into 5 bundts. It would be fun to make extra for gifts. I made this on a recent snow day and since we were snowbound at home, I stuck with the small batch recipe for two. Initially, I considered tucking some finely chopped chocolate or miniature chocolate chips into these cakes (and then dusting the finished product with confectioners' sugar as per the recipe). But the cakes themselves have plenty of flavor and are rich enough without it. I couldn't resist adding a ganache glaze and I'm happy I went that route. You can never go wrong with ganache in my book and my family agrees wholeheartedly! We all had fun digging into our pre-Valentine's Day bundts. Now I just have to either make these again or come up with some other worthy chocolate alternative for our dinner in a couple of days! Place chocolate, espresso powder and cocoa into a small bowl. Pour boiling water over top, cover, and let sit until chocolate is melted, 3-5 minutes. Gently whisk mixture until smooth (if necessary, you could warm the mixture on half-power in the microwave for a few seconds). Whisk in the sour cream and vanilla. In another bowl, whisk flour, baking soda and salt together. Using a hand-held mixer (or proceed by hand like I did using a wooden spoon and rubber spatula), beat brown sugar and softened butter in a medium bowl until sugar is moistened. On medium-high speed, beat until mixture is pale and fluffy, about 3 minutes, scraping down the sides of the bowl as needed. Add egg and beat until combined (the batter may look slightly curdled). Reduce speed to low and add flour mixture in 2 increments, alternating with the chocolate mixture. Divide batter between the 2 mini bundt pans. Tap each pan on the counter to dislodge any air bubbles and wipe any drops of batter around the sides of the pan. Place the bundt pans on a baking sheet (if using individual mini bundt pans) and bake until a cake tester inserted into the cakes comes out with some moist crumbs attached, about 20-22 minutes (but check early because mine were done closer to 16-18 minutes). Rotate pan halfway through the baking time. Remove cakes from the oven and let cool on a wire rack. Optional ganache glaze: You can simply dust the completely cooled cakes with confectioners' sugar before serving. To make the ganache glaze, bring cream and corn syrup just to the boil. Pour on top of the chocolate and espresso powder, and let sit 1 minute. Gently whisk together until smooth. Let ganache cool slightly so that it thickens a bit but is still pourable. Pour on top of the cooled cakes and let ganache set before serving. Aww these are so cute! I really don't make enough things in mini form, which is crazy given that it's just me and the.boy here...eating ALL OF IT. :P These are awesomely chocolatey. Mini things are an express route to cuteness, I think. ; ) Ironically, this is one recipe I'd likely double next time around since I have a mini pan that makes 6 at one time. Stay warm! I love how tall and mini your bundt cakes look and that moist, fine crumb is hard to resist, Monica. Monica these are so adorable! 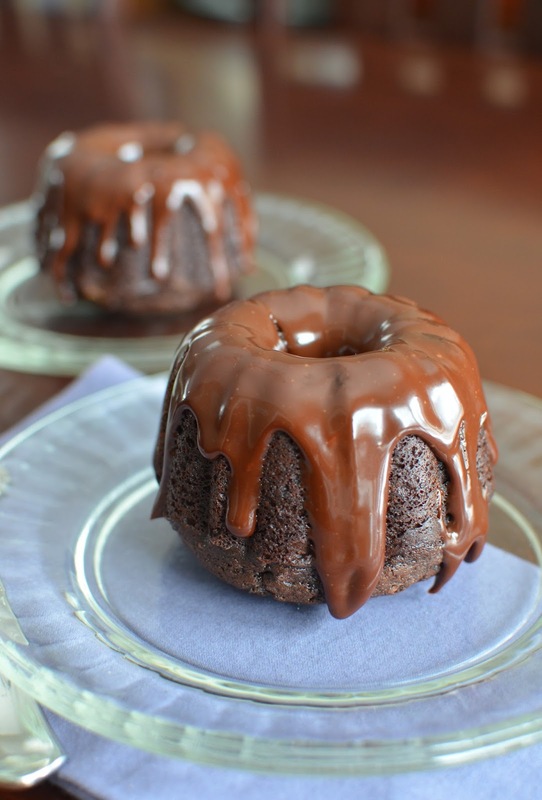 You make we want to run out and buy these cute little pans AND make chocolate mini-bundts! 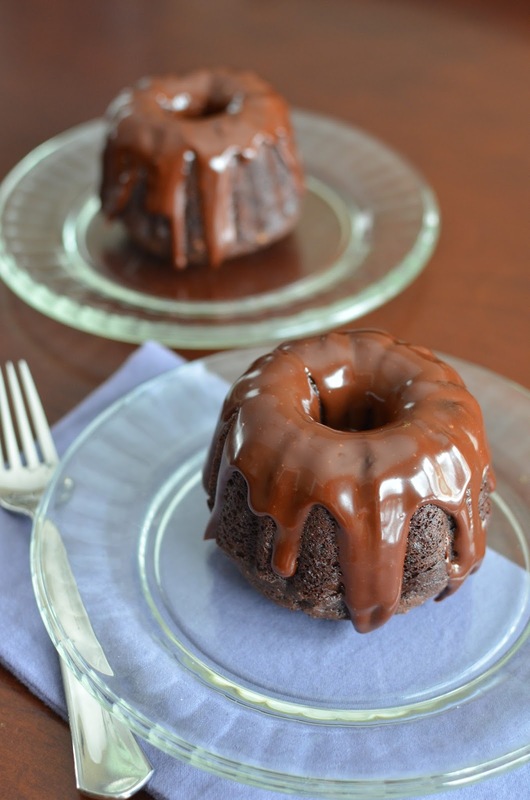 I love the chocolate glaze and the moist crumb looks amazing - and you made them by hand! That is extremely cool in my book. We have it so easy now with our stand mixers and dishwashers. But at least we love homemade and don't always settle for a dessert from the cookie aisle in the grocery store. I know your son loved these! I don't have that cookbook but want it now. I always look for ways to cut down the recipe size - thanks! Have a wonderful Valentine's Day with your two sweeties! What a sweet comment, Tricia. Thank you. I just love Valentine's Day and the general excuse to eat more chocolate. Bundt pans are so beautiful and the little ones work well for me...it can be a little time consuming to get the batter into the little openings but I'm willing to do it. : ) You have a wonderful V-day yourself!! Oooh now I feel like I need to add another kitchen tool to my cabinets... I need mini bundt pans! These are gorgeous- the cake looks seriously perfect! haha - we all manage to make more room for little kitchen gadgets, don't we... Thanks! These are so incredible cute and delicious looking Monica! I love the ganache glaze on top and how perfect these are for Valentine's Day! I'm not sure why, but everything just seems more delectable when it's made in miniature form, these looks amazing!! So true...it's always so cute and dainty even if it's a rich chocolate cake. : ) Thanks, Sue. I love anything mini and these little bundts are no exception! I might have to get myself some of those pans ;) (perhaps when I get my free time back). The texture on these looks sooo moist and delicious. Happy early Valentine's Day, Monica! I hope you have a nice relaxing celebration with your chocolate-loving hubby, Kelly! : ) Valentine's Day is such a great excuse to enjoy more chocolate or make pretty heart-shape and pink things! I love it! Haha - thanks, Betty. I'm happy with my mini bundt pan. : ) And you totally don't need to share...one each works for me, too! Thanks, Juliana. Have a lovely V-Day! Tempting me too much to make mini bundts. They are super cool Monica, and you whipped with a wooden spoon..what?..Wonderful job. The texture is perfect. Darling, you have frosted it so cute. This sure is a sweet dessert for Valentines. Yes, good ole wooden spoon and whisk at work. It's funny because I kept wondering if I'd whipped/stirred it enough. Not used to it, I guess. ; ) You have a lovely V-Day and weekend ahead, Asha. And chocolate cake with chocolate ganache?? I mean how could you go wrong?? These look so good! And I did play it safe...chocolate with more chocolate is my motto. : ) Have a great Valentine's Day! Hope your husband cooks you a wonderful meal. Such cute little bundt cakes. Just perfect size - one for each person. And that chocolate glaze looks so yummy: so thick and shiny! Hi Monica, i thought the tunnel of love was such a sweet thing to say. Love chocolate ganache. Happy Valentines Day! Aww...thanks for saying that, Cheri! : ) You have a nice Valentine's Day, too. Hope it's relaxing! OHHHH, I am in love with these little bundt cake!!! They are so cute and must be super tasty!!! Just perfect for a chocoholic like me! I would request my husband to get me a mini bundt pan now! Have a sweet Valentine's Day, Monica! Monica, in keeping with our tradition of doing the similar things at similar times, i should tell you i made a bunch of mini-bundts a week or so back. They're vanilla, so i'm happy to have contrasting flavor - yours! - to add to my list of must makes. because how can you not love a mini-bundt...they're perfect. I'd vote to stay in too if I have these lovely cakes served to me at home : ). They look adorable to me with or without the glaze, and yes, I too have to agree wholeheartedly that the moist, dense crumb make them look more irresistible. Happy Valentine's Day and Enjoy! Thanks so much! Hope you had a great Valentine's Day! Gorgeous! I need to buy mini bundt pans especially since I love bundt cake pans so much. Loving the cake and all the glorious ganache on top! These look so rich and chocolaty, Monica! I have a tradition of sending a ganache covered chocolate mini-bundt in my son's birthday care package every year(along with what ever I come up with that year). Usually I use a Trish Boyle recipe. My ganache never looks this good! Even though I use corn syrup, it never seems to get shiny like yours. These look so good I may be changing recipes next year! At the very least, I need to do some comparison taste testing! What lucky kids you have! Opening up a birthday package with a mini chocolate bundt (not to mention your other treats) inside sounds like just about the best thing ever! I normally skip the corn syrup altogether unless I want that shiny look for a special occasion. I actually use very little but if you want it shinier, I imagine more helps with that. It does turn more matte as it cools. As far as I'm concerned, I'll take it matte or shiny...it tastes so good! lol "tunnel of love"...so great. And the ganache topping came out beautifully! That glaze is making me drool!! Love it. Any time there's ganache on something, it sort of steals the show. Oh wow, how do you pour such a perfect glaze on your bundt?!? I'll have a slice or two, please. Oh, who am I kidding! I can eat this whole thing - cake for one, please and thank you!